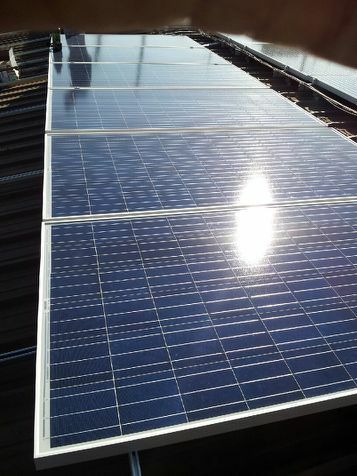 Solar panels installed on the roof at MA Tech Services in St. Louis. Axelbaum, in his rebuttal of Resolution 124, cast aspersions and doubt on any effort to transition fully away from a fossil fuel-dependent economy in which colleges of science all over the world agree is responsible for climate change. He stated that 77 percent of our energy needs through 2040 are projected to come from traditional fossil sources. Between his critique of the weaknesses of sustainable energy sources to meet the current energy demands and scoffing at systemic, forward-looking attempts to plan for a national move toward full adoption, he characterizes the St. Louis pledge as misguided folly. Professor Axelbaum’s championing the call to do nothing and continue reliance on coal, oil and natural gas ignores major issues that even the fossil fuel industry acknowledges. First, major utilities across the nation have begun to diversify their industry by investing in and researching renewable energy. Even in our state, Kansas City Power and Light has planned to increase its wind power production from 15 percent to 20 percent and reduce its coal-fired power production by 7 percent in the next three years. It is not an outlier. In a second example, ExxonMobil’s internal documents have revealed the admission that their industry was contributing to climate change. If the very industries that Axelbaum defends as the only credible solutions are investing billions of dollars in renewable energy, how could it seem foolish for our city leaders to plan for a future of renewable energy use that is occurring in the present? How can such action be called misdirection? It would be misdirected folly for our city and many others like us, who are dealing with climate change through recovery from violent weather and rising oceans, to continue functioning with fossil fuels as our only choice for energy needs. We should not only applaud our city aldermen but now join to plan and structure a rollout of renewable energy use that is just and inclusive, unlike the development of the old, traditional energy sources of which we are still suffering the effects with climate-related health issues and Superfund sites. Missouri is home to many Superfund sites, including the West Lake Landfill in Bridgeton. The Superfund sites are a reminder that the environmental cost to our land and water sources has been severe. Misguided and ill-informed usage of the old energy sources may be accepted as reasoning for past environmental harms, but that reasoning is not acceptable in our contemporary context as vast volumes of academic knowledge have increased our ecological understanding. Therefore to hold to the status quo of energy development and usage in an era of worldwide acceptance of the Paris Accords and the consensus on climate change is to regress. Just as fossil fuel energy production has a price that impoverished and minority communities are still paying — today across this country from Martin County, Ky., where Massey Coal’s 250 million gallons of sludge ruined the Big Sandy River, to the Dead Creek Superfund cleanup cost in Sauget — progress has come at an enormous cost, and regression cannot be contemplated. Do not be misguided by status quo arguments against the campaign to transition to 100 percent clean energy, but rather join the effort to shape a cleaner future of energy for St. Louis by letting your voice be heard in the planning stages. In the past, energy development was decided by a few and community voices were not heard, but now the follow-up work to Resolution 124 offers an opportunity to collectively and intentionally include voices from all St. Louisans to map out clean energy implementation.